"Congress is fighting to keep pizza and French fries on the school menus when we have an obesity problem nationally." -- Margo Wootan, "Potato politics, with a pizza side"
As a southerner, I was weaned on watermelon - big slabs of glistening red flesh, polka dots of seeds that we practiced spitting from the edge of the porch -- so mixing such ambrosia with other ingredients has always seemed inappropriate. That changed a couple of years ago, when a friend brought a salad of watermelon, feta, red onions and kalamata olives to a potluck party. 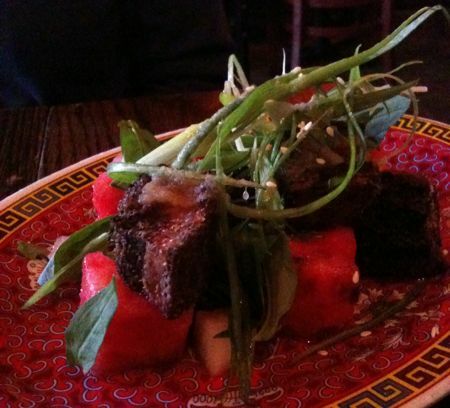 My mind was further opened by the best dish from a recent meal at the Fatty Crab, in New York's West Village: Cool watermelon and hot crunchy pork belly, with Thai basil, lime and scallions. The regret? Watermelon season, always too short for me, is waning. At my supermarket here in New Jersey, bins of them have been replaced by wan sliced specimens wrapped in plastic. In a happy confluence, family and friends arrive just two weekends from now. 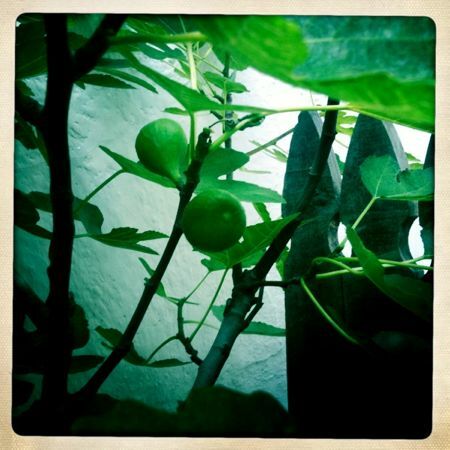 Will the Marseilles figs be ripe? And the question is whether we stand there, eating them from the tree and warm from the sun, or make Melissa Clark's fig tart with caramelized onions, rosemary and Stilton. Figs are rich in potassium, calcium and Vitamin A. Tarts, especially Ms. Clark's, with pine nuts, honey and rosemary, could provide for us a virtual trip to the Mediterranean. From strategic placement of fresh flowers to ice and water around vegetables and faux stacks of cartons, Whole Foods, others prime us to shop, says author of "Brandwashed"
Scrutiny of sugar tariffs, corn subsidies shows reason for ubiquity of high-fructose corn syrup in diet and is example of corruption in Congress, says Lawrence Lessig, in "Republic, Lost"